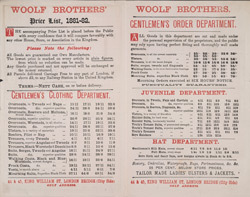 For much of the 19th century, tailors shops such as that of Woolfe Brothers, in London Bridge, usually opened from 8am until 9pm or 10pm. After closing, there was more work to be done tidying displays and sorting materials. It was not until the 1890s that shops started closing at the standard modern time of 5pm.